This year is going to see a lot of commemorations of momentous events from 1965. The marches from Selma to Montgomery and the Voting Rights Act (recently depicted in the movie Selma), the establishment of Medicare, the assassination of Malcom X, and the completion of Eero Saarinen’s Gateway Arch in St. Louis are just a few. One event I’m particularly interested in is the establishment of the National Endowment for the Arts. Historian Donna Binkiewicz, in Federalizing The Muse: United States Arts Policy & The National Endowment for the Arts 1965-1980 provides a really useful history of the foundations’ birth. In early 1965, legislation creating The National Endowment for the Arts and The National Foundation for the Humanities was introduced in both the House and Senate on the opening day of the second session of the 89th Congress. Various advisers to President Johnson, including Senator Pell, believed that the joint foundation legislation would have a better chance at passing than the arts bill would alone. Over the coming months, various drafts and versions of the arts and humanities legislation would be introduced. LBJ watched the proceedings closely and submitted his own version of the bills, including an idea circulated in the Kennedy administration’s draft legislation for a national arts program: the requirement that the federal funds given out for arts projects be matched equally with private sector funds. On Sept. 29, 1965, LBJ signed the act creating the National Endowment on the Arts and the Humanities into law (Binkiewicz, 79-89). Here’s a link to that legislation. Over the next 50 years, less money would go to individual artists and more NEA money would go to state arts boards and agencies who often awarded matching grants. The NEH has already started commemorating its 50th birthday, and the NEA chair has also announced a collaboration with the National Parks Service (which will soon celebrate its 100th anniversary) for ART WORKS, a funding partnership that will award proposals for art works that “engage communities” and capture the “thrilling landscapes” and amazing stories that inspired the national parks. This is a good time for those of us interested in poetry communities, organizations, and institutions to think about the politics of funding. We need to think about how poets, who consider ourselves part of communities, who organize events or workshops within or on behalf of these organizations, or who help them run, talk about money. Specifically, how do organizations/communities need to express discourses which make them accountable (or at least make them sound accountable) to funders? How does this discourse sometimes come into conflict with other discourses the community espouses and uses to express its identity? I think that that moment–when those discourses contradict each other–is when the arguments happen. Identities (expressed through discourses) begin to clash. According to Binkiewicz, part of President Nixon’s rationale for repeatedly doubling the NEA budget was to “appease or control discordant groups” (Binkiewicz, 147-149), so when 1970s poetry communities who identified as countercultural applied for and received NEA money, did that mean that they capitulated to Nixon? Could they still be countercultural if they used federal money to survive? Were they “bought off”? It isn’t just federal money that creates identity problems. According to Chin-tao Wu, in her book Privatising Culture: Corporate Art Intervention Since the 1980s, the tax codes established in the 1970s doubly reward corporate arts funding. They are not only provided with tax write-offs, but the codes help them successfully turn “art museums and galleries into their own public relations vehicles” (Wu, 2). These rewards got more and more lucrative from the 1980s onward. Some poetry communities embrace countercultural discourses that reject mainstream capitalist behavior. But if they apply for and receive grants from private or corporate foundations, is their identity compromised? Joseph Galaskiewicz, in Social Organization of an Urban Grants Economy: A Study of Business Philanthropy and Nonprofit Organizations, his study of corporate giving in the Twin Cities from 1979 to 1981, raises this very question: “non-profits (who ask for money) must manipulate the referents of legitimacy. One of these is the organizational goals that reflect the values of the dominant society” (Galaskiewicz, 147). In other words, poetry organizations who find a way to “manipulate the referents of legitimacy,” to speak in a discourse amenable to funding sources, do so at the risk of de-emphasizing other discourses that contribute to their identity in the first place. Those of us who consider ourselves part of poetry communities/organizations need not only to think about these questions; we need to talk about them with each other. If we don’t, our arguments and conflicts about who we are and want to be won’t go away. They will likely erupt in ugly fashion. I said in my previous post that it’s rare that cities have such a thing as a city-wide poetry community or city-wide literary community. I said that I think that we only tend to feel like part of a city-wide literary community in moments when all the poets have a major issue or concern or unifying point. Today is one of those days. One of the reasons that the Twin Cities literary scene is so strong is because of Allan Kornblum, the founder of Coffee House press. He passed away this morning. Here is the official announcement, and a touching tribute from Chris Fischbach, on the Coffee House blog. I met Allan for the first time around the year 2000 after a Rain Taxi reading. I hadn’t been in the Twin Cities long, but I’d been impressed by what I saw and felt from those already there. Allan was one of those impression-makers; we met over a bowl of chips and salsa in the kitchen of Josie Rawson’s house in an after party. He was friendly and jovial. He asked me how I liked the Cities so far, and I remember remarking that I found the literary scene friendly and not grossly competitive (unlike other places I’d been). He agreed that it was quite nice. I remember that moment fondly and often recounted that moment to friends when praising the Cities’ scene: you could have a friendly chat over a big bowl of chips with the editor of a major press and no one would suspect you of having some kind of creepy publishing motive. While I knew that he was the publisher of Coffee House, I didn’t yet know much of the history he’d helped shape. As I dived into my studies of the poetry scene of the Twin Cities in the 1970s, I learned much from his essay “A Couch, Spaghetti, and a Salad: How Book Fairs Brought Coffee House Press to the Twin Cities, and the Literary Community We Found Here.” Here he describes his arrival to the Twin Cities’ publishing scene and his reasons for relocating there, and it’s a really important documentation of what the scene was like in those years. He credits the presses, publishers, and bookstore owners for creating a fertile and rich book environment and he gives readers a really good sense of the missionary role of the small-press publisher in the counterculture of that time. Some of those presses survived, and Coffee House was one of them, helping shape the Twin Cities literary community into the place that presses, writers, and magazines continued to move to in the 1980s, the 1990s, and the 2000s. He was able to join his evangelical zeal for good books and independent publishing with a willingness to do the not-so-glamorous work of the book business. I’ll always be grateful to him for that, and I’ll always remember Allan as a friendly mentor figure at readings and festivals. Some of the books I treasure most — some of the books that I feel helped train me into poetry — are Coffee House books. In Allan’s honor, I’ll be spending some time with them tonight. I’ll read and remember with gratitude for his part in building a literary community. When I talk about my scholarship, I often say I focus on the conflicts within literary communities because I think those conflicts–what we say when we argue about poetry–teach us something about our values regarding poetry. I started my research by looking at two poetry communities that started in the 1970s: the Loft in Minneapolis and the Jack Kerouac School of Disembodied Poetics at Naropa. I wanted to know what their early major conflicts have to teach us in literary communities now, and this is the guiding direction of the book I’m working on. But I rarely get a chance (at least in traditional scholarship forums) to say why questions of literary community concern me so. Over the last 15 years, I have had the great luck to be involved in a number of literary communities In job applications, I call this “experiential scholarship,” the learning I’ve gained by by participating in poetry communities. One of the most important things I’ve learned from my experience is how important literary communities are to the work of literature. The work that literary communities do, from putting on events, running workshops, providing space for informal and formal gatherings, and encouraging the writing, is vital. I was thinking about all of this yesterday as I walked back to my car from The Letters Festival, an independent small press festival held in Atlanta. I met poets, fiction writers, teachers, journal and zine editors, publishers, and reading series organizers. I got to see folks such as Bruce Covey, Christeene Alcosiba, Adam Robinson, Laura Relyea, and CA Conrad again and meet the amazing organizers of the fest, Scott Daughtridge and Stephanie Dowda, as well as many other editors and organizers. The fest was held in Goodson Yard, a large and open re-purposed old brick factory building at the Goats Farm Arts Center. The book market part of the fest had about 25 tables circled around a seating area with a few couches, chairs and side tables. A room across the way held readings and workshops throughout the day. 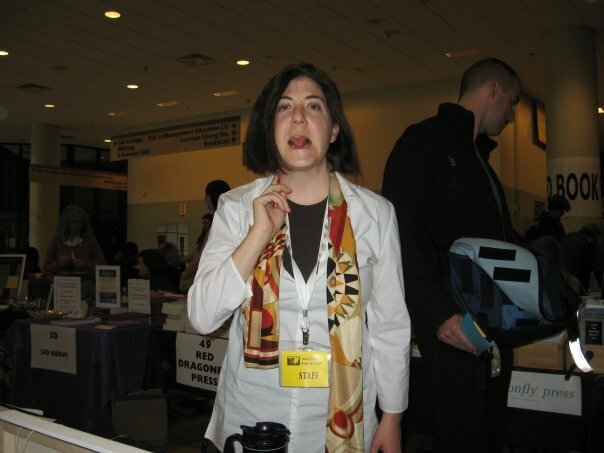 It felt so familiar; it felt like the early years of the Twin Cities Book Festival, held for the first time in 2001 in the Open Book, a re-purposed old brick factory building in Minneapolis. 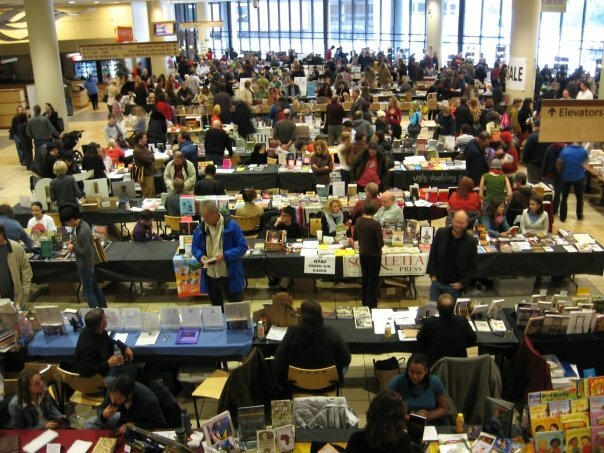 Bookstores, presses, journals, and literary organizations staffed tables upstairs and down, many table occupants knew the people at the table across the way, and a friendly mixing of editors, readers, writers, and bookstore owners was the rule of the day. There was a spirit of “little fish can make a large school.” Most independent literary journals, presses, and organizations don’t have the budgets of mainstream or commercial presses, huge marketing departments, or the institutional heft of the universities in town. But together, they represented the wide liveliness, energy, and diversity that many in Minnesota and the region now look to the Twin Cities Book Festival (and its sponsor, Rain Taxi) to promote and support. While the focus and reach of the fest has expanded somewhat (to include a Children’s area and other elements. ), founder Eric Lorberer and the TCBF team have been very careful about how and when to grow; thus the TCBF has retained this lively spirit of independent camaraderie and a celebration of local and regional scenes as well as ties to national and international scenes. I came to the Twin Cities to attend Hamline’s MFA Program and I was looking for literary community. Soon after I arrived, I met Eric and started to volunteer. I learned so much about poetry, about how literary communities and scenes work, and about small press publishing from being part of the Rain Taxi community and working events like the TCBF. I learned that while it’s possible to be a successful writer (whatever “success” means to you) without participating in literary communities, it’s usually a lot harder. As I said in my previous post, communities help train you into the work of being a writer, editor, or literary activist. An added benefit of the emphasis on small and local is the joyful welcome afforded to new members, not just because you pay your table fee, but because you show up and want to take part. Since moving to Atlanta two years ago, I’ve been looking to get more involved in poetry communities, and I’m heartened by yesterday’s experience, the same joyful welcome (even during the short time I spent there). Though only in its second year, TLF has the potential to do for Atlanta what similar festivals and book fairs do for literary scenes in other cities. With a focus that’s emphatically different than commercially-sponsored book / arts / neighborhood festivals, events such as TLF celebrate small and independent presses, journals, and organizations and the local and regional scenes they emerge from. They encourage collaboration, cooperation, and invention: they develop ways to keep doing literature and community without a lot of resources. They welcome newcomers into the work. American poetry studies have recently been enriched by approaches from critical and pedagogical theories within the field of Composition and Rhetoric. In some cases, these approaches can open new avenues for scholarship of poetry communities, scandals, debates, and histories that traditional literary and poetry studies cannot. The potential for Comp/Rhet theory and pedagogy to influence important questions of poetry studies is great, especially concerning “big debates” about poetry values in the current American poetry landscape. Comp/Rhet (sometimes called Writing Studies, Writing and Communication, Rhetoric, or Composition) covers a wide range of topics related to the fields of composition, first-year writing, rhetoric, discourse, literacy, technical communication, genre studies, and writing center studies. In many institutions and publications, Comp/Rhet scholars’ research is deeply connected to and based on their teaching. This panel seeks to highlight and discuss new work that furthers this enrichment of poetry studies through Comp/Rhet, and therefore welcomes papers or presentations that approach the topic in a variety of ways, including but not limited to: applying current theory in Comp/Rhet to debates, problems, or scandals in American poetry since 1900; studying the rhetoric or discourse of poetry communities and/or institutions; employing rhetorical theory for the study of one poet’s work; and deploying composition pedagogical praxis in poetry studies. 300-words (double-spaced and titled), omitting all references to the submitter. Previously presented or published papers are not eligible. Please Stop Saying “THE Poetry Community.” Please? I love you, but please stop it. So many of you do it all the time. You’re talking about poetry in a blog or a magazine, or a Facebook post or tweet, and will say “the poetry community,” presumably meaning all the poets in the U.S. Here is the Poetry Foundation doing it, right at the top of their page. Kate Angus does it here in her post “Americans Love Poetry But Not Poetry Books,” in The MIllions, and here is The Guardian doing it in an article about poetry plagiarism. This isn’t a new thing; here it appears almost 20 years ago in an article about the Yasusada controversy. 1. It’s inaccurate and too broad. There are many thousands of poets in the U.S., and while community studies scholars do discuss communities that are national in scope, those communities have to agree on the same values, and they tend to be hard to sustain over time. Whenever I hear someone say “the poetry community,” I undergo the same conniption fits I do when someone says “the gay community.” I am gay, but do NOT feel in community with gay women who are fervent followers of LGPA golf. I mean, come on, it’s not like golf is really a sport. I similarly do not feel in community with cowboy poets or hallmark poets even though I’ve nothing against them. But the fact that we call ourselves poets is not enough. 2. It obfuscates real difference in values. Saying “the poetry community” obfuscates differences between me and a cowboy poet. I know I do not share their aesthetic values, and it’s possible I do not share their political or economic values as related to poetry. Sharing values–agreeing on what poems should look like, how they should sound, the depth and breadth of their concerns–is important to feeling “in community” with other poets. Sharing values about how and when to raise funds for poetry, how to run poetry organizations, what kinds of social goods to advocate for, and who to hold up as exemplary poets is important to feeling “in community” with other poets. While the perception that there was one American poetry community was somewhat supportable a few decades ago, it’s not true now. Poets who saw the same names printed in the same poetry journals as theirs, or poets who saw the same poets at events or in the small amount of MFA programs at the time might be somewhat forgiven for thinking that they belonged to a strongly delimited yet national poetry community. I say “somewhat” because some of those poets worked hard to obscure and discount poets and poetries that did not fit their aesthetic or political points of view. For these poets, saying “the poetry community” was a way to exclude and erase poetry they did not like. If you’re someone who tends to say “the poetry community,” you should be aware of the multiplicity of poetry communities out there. You may have had poetry mentors who believe that there is one sort of “good” poetry and community to which all poets should aspire, and that you should ignore anyone who isn’t a “spokespoet” for that poetry. We know now how problematic that belief is: it often emerges from unexamined assumptions about aesthetics, language, class, race, culture, and privilege. I contend that it also does damage to specific and local poetry communities and organizations who work to build audiences for poetry. 3. It covers over geographical / local difference. The problem with claiming a national poetry community is that local poetry scenes or literary ecologies are ignored; there are poetries influenced by the regional and local. We have to be careful, however–are all the poets in a city in the same poetry community? Most of the time, I don’t think so, though it’s better than saying “the poetry community” and meaning all of a country’s poets. There are multiple communities of poets in Minneapolis-St. Paul, and I do not feel a part of all of them. I wouldn’t normally say “the Twin Cities Poetry Community” or “the Atlanta Poetry Community.” You have to have the same values, not just the same locality. You’ve got to have something more specific. That said, there are times when local poetry scenes can feel like unified communities–often when they have a common goal or concern. But this feeling (and the cooperation it creates) can be ephemeral and fleeting. I also wonder whether saying “THE poetry community” betrays some anxiety that comes from wishing for what sociologists call “pre-modern communities”: distinguished by their specific locales, lack of individual freedom, and relatively small size. Modern communities, in contrast, are now flexible in both definition and membership. In the field of community studies (which includes social scientists, theorists, and activists), there is less of a desire to define communities than there is to think about how they work, and how different cultural changes affect our experiences of communities. From “liquid modern communities” to “imagined communities,” to “the symbolic construction of communities,” there is an extraordinary multiplicity of opinions about how communities work and what they look like, especially in the digital age. * Not only are communities a lot more liquid, but people join and leave them more quickly, and their membership is multiple. Poetry communities need to be specific, clear, and consistent about who they are and what they want from poetry and their members. Use modifiers! For example, when I talk about the poetry / literature communities that I feel a part of, I will say: “the Rain Taxi community,” “the Poetics List community,” “the Maine poetry camp community,” “the Hamline poetry community,” “the Midway poetry community,” and “the Georgia Tech poetry community.” Yes, we’ll sacrifice the dream that all poets in the country share values and / or approaches. But what we’ll get is a more accurate and ethical vision of our diverse poetry landscape. * A great resource on the current picture of community studies is Key Concepts in Community Studies, edited by Tony Blackshaw. Welcome back! If you assumed that I haven’t updated the blog in awhile because Ive been working on other things, you’re right. But with the new school year and the reinforcement of the lesson that writing more helps you write more, comes new determination to re-vivify this thing and keep it alive. Please feel free to suggest blogs I can add to my follow list, and please comment and ask questions. I’ve been thinking about the discourses of poetry communities a lot lately, after spending the last few months immersing myself in the field of discourse analysis–I realized that it’s what I have been doing in my work for almost my entire scholarly career. As I mention in my previous most here, I have always been really fascinated by the arguments about poetry. Now I know that this is because those arguments convey and express dearly held discourses. In the field of discourse analysis (Introduction to Discourse Analysis), a “discourse” is a way of performing a certain kind of identity that is recognizable to community members. We use language, actions, interactions, ways of being, and various tools to “enact” these identities. 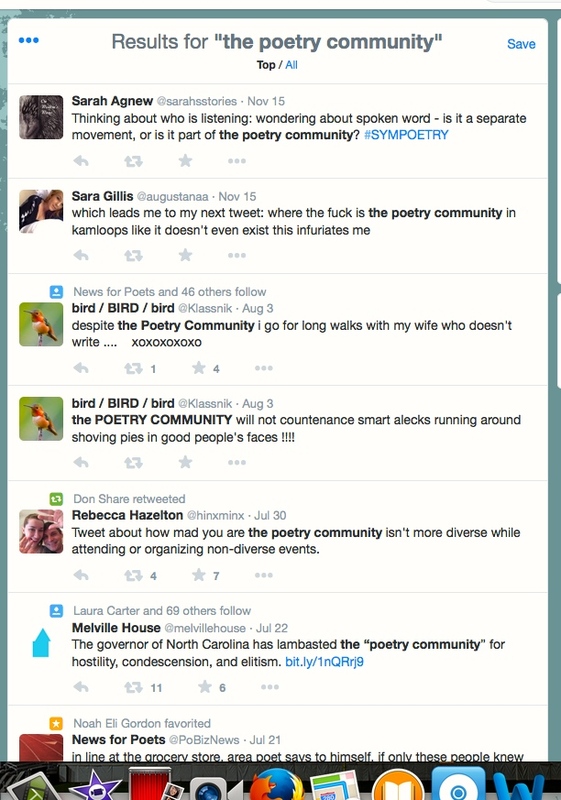 I think that this is what poetry communities do: help poets develop and enact poetic identities. I’ve been working on a paper for the upcoming American Literature Association’s Poetry Symposium in Savannah. In it, I argue that discourse analysis can help us usefully read poetry conflicts, and then I perform a discourse analysis of a manifesto produced by the Croatoan Poetry Cell, involved in protests at the Poetry Foundation in 2011. The text shows how differently the communities involved feel about countercultural poetry, institutions, and poetry funding. I’ve also been corresponding with the poet Meryl DePasquale about a “how to submit to poetry journals” chapbook draft, and I was reminded of a talk I gave through the “Works In Progress” series at Minneapolis College of Art and Design three years ago. In this talk, I wanted to explore the question of why we might still need communities, when anyone can publish a poem online, without an editor, now. I said that in the past, communities helped train poets in how to be members of poetry communities: how to build supportive networks supported poetry by setting up readings, space, classes, and events; how to start presses and journals; and, yes, how to get one’s own work published. Most importantly, a poetry community will teach new poets the values / aesthetics of the community, and this is, I said, why we still need poetry communities in the age of instant digital publication: without those people who share your values and aesthetics, there aren’t readers for your work. Communities disabuse novices of the romantic ideology of the isolated genius writer, and educate them in how to be a poet in that community through the discourse of that community: publishing practices, belief systems, methods, purposes, and behaviors. The poetry landscape in this country is made up of many different poetry communities, scenes, and networks, online and offline, who welcome the involvement of new poets. By training themselves in the discourses of communities of poets whose work they like, new poets exchange “labor” (ranging from peer reviewing poems, volunteering at events, cleaning or building spaces, working on websites, etc.) for a community of readers, of people who recognize that poet as a poet. Discourse analyst James Paul Gee (linked above) is fond of saying that through discourse, we “say, do, and be.” In this technological moment, poets need communities because communities show poets how to speak as poets, do poetry, and to be poets. I kid; this blog doesn’t claim to be a definitive list of “Somewhat Important Poets.” This blog is about the mis / adventures, scandals, and conflicts between and within U.S. poetry communities in the 21st century. This blog explores how we–in our various and often overlapping poetry communities–decide which poets are important and why. My research is about poetry communities, including what poetry communities do to create importance for poets and poems, and how differing definitions of important poets and poems create conflict. Sometimes these moments of instability or crisis are productive, as they tend to expose and underscore previously unspoken differences in poetic desires, values, and goals. I find these occasions, when contradictory pressures are placed on poetry, deeply compelling. They are at the center of my work. I am struck such swift and potent reactions to both of these online publications. Digital life can facilitate communities–as well as community imbroglios–by making communication within and between them almost instant. Yet the existence of lists of poets matters: why do we pay such attention (when we could just scroll on by)? In our data-obsessed and immediately accessed digital lives, I’m not surprised that some poets were irritated by how such lists reduce a poet’s ineffable poet-ness down to a single line & adjective. But consider: the reception of the lists depends on whether we recognize the names through participating in various poetry communities. It’s easy to get lost in such an environment as ours, where agreement on a single, definitive, national list of “important” American poets is impossible. Do we skim the lists, read them, critique them, question them, look for ourselves in them, and talktalktalk about them because we need them? Do lists help us find out where we are and where we belong? Please Stop Saying "THE Poetry Community." Please? Discussing the American television series, Northern Exposure.